Black beans, crisp greens, fresh vegetables, and Cotija cheese, brightly dressed in a simple lemon vinaigrette. This is a delicious healthy salad recipe! Hey there, Friends! I hope y’all had a happy Easter weekend. We had a great time around here, enjoying loads of glorious sunshine. It was a bit colder than I would have liked, but the snow storm that was predicted to dump 3 to 4 inches of snow on us blew to the south, thus entirely missing us. I really can’t complain! Our Easter weekend is full of traditions. Family movie nights, long walks in the woods with Daisy, coloring Easter eggs, and kicking off the family Whiffle Ball season. Then there is baking an extra batch of Braided Cardamom Bread, hoping to see a slice on Easter Sunday. And of course, an Easter egg hunt that Bacon Slayer and I are forced to make more and more challenging each year, because the Sons are getting so good at spotting them. I had to hide a few eggs in high tree branches, just to keep it interesting for the older boys. Took them forever to find those eggs! Score one for Mom & Dad. I serve a relatively simple and balanced dinner of pork roast, roasted baby potatoes, garlic green beans tossed in a fab butter sauce, and blueberry pie. Oh, I also managed to eat my weight in Starburst jelly beans on Sunday. I’m not even a huge fan of jelly beans, but Starburst rocks those citrus-y little numbers. Obsessed doesn’t even begin to cover my feelings toward them. I can’t stop eating them! I wonder if they have a sort of Strange Brew thing going on with those things? After clawing my way out of a sugar coma, my body is craving this healthy black beans salad something fierce. To right myself, I tend to compensate for sugar benders with vegetable infusions for a few days afterward. Salads can be so boring, so my favorites must have a huge variety of “stuff” in them. The variety of vegetables keeps the salad interesting, while also giving The Sons the ability to pick out their favorite additions. Only Son #1 will intentionally eat a leaf of lettuce, so I try to make salads that contain components that the other boys will eat, like black beans. 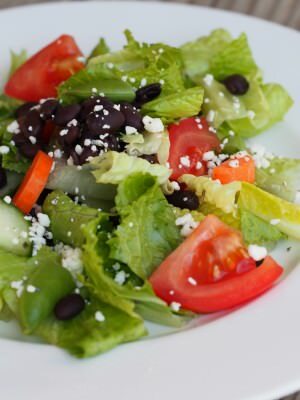 Black beans salad with lemon vinaigrette is a meal in itself, with enough variety to keep the whole family happy. It’s a good mix of vegetables, healthy fats, and proteins, dressed in a simple lemon vinaigrette. The dressing is simply made from pantry staples, making it so easy to assemble. 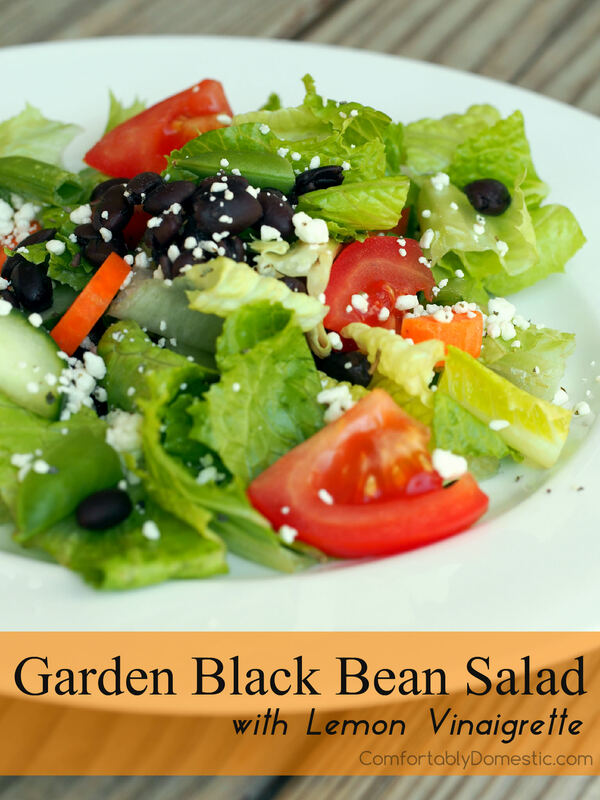 This healthy black beans salad is the perfect meal to counteract a little overindulgence. Crisp greens, fresh vegetables, tender black beans, and Cotija cheese, brightly dressed in a simple lemon vinaigrette. Layer the lettuce, carrot, cucumber, avocado, sugar snap peas, and tomato chunks in a large salad bowl. Scatter the black beans over top of the rest of the salad, and then sprinkle the Cotija cheese over all. Set the salad aside while preparing the lemon vinaigrette. Place the fresh lemon juice, apple cider vinegar, water, honey, oregano, salt, pepper, and garlic powder into a pint sized jar with a snug fitting lid. Firmly affix the lid onto the jar, and shake the contents vigorously to emulsify the dressing. 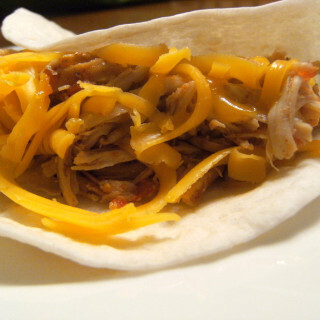 Serves 4 as a main dish or 6 as a side salad. I think it`s important to eat your weight in jelly beans from time to time. Uber important really. I love this salad, it`s perfect for this time year. And also perfect for Easter. Wish we lived closer so we bake for holidays together. Your Easter dinner sounded wonderful and I'm totally digging this salad! I need something like this after a holiday weekend! We had a lovely albeit cold Easter weekend as well. Fun traditions with family are always my most looked forward to event! Your salad sounds perfect! Oh - I totally need this healthy salad! My daughter has a ton of candy from the Easter Bunny but eats very little of it (leaving more for me to eat!). That sounds like a good Easter! I don't think I've ever tried the Starburst jelly beans...but I love me some Starburst, so I bet I'll like them. I love "meal salads", and this sounds like it would hit the spot. I know what you mean about a sugar coma. Your feast sounds amazing and this salad sounds perfect!! 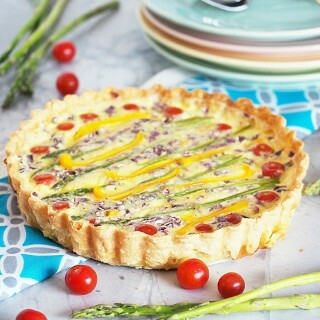 I am definitely craving something fresh and delicious like this right about now!